Even in the face of catastrophic climate and health damage, as highlighted recently by the IPCC 1.5℃ report, why is it so hard for us to break our energy consumption ‘habits’? Even in the face of catastrophic climate and health damage, as highlighted recently by the IPCC 1.5℃ report, why is it so hard for us to break our energy consumption habits? Governments, NGOs and the media are telling us to reduce our energy consumption. After all, the burning of fossil fuels is the main source of climate change and air pollution. Both are causing huge environmental and health damage with major implications for current and future generations. But, reducing our energy consumption is easier said than done. We use energy to heat our homes and cookers, power our lights, TVs and computers, and drive our cars, buses and trains. Without energy, our lives would be cold, dark and boring. To understand why it is so hard to reduce energy consumption, I sought to understand how much we value using energy, and how this has changed over time. Also, I thought that by knowing which uses of energy are essential and which ones are less important we can start to focus policies on reducing non-essential uses first. While plenty has been written on energy consumption, there were no attempts to quantify the benefits from the introduction of new energy sources and technologies. 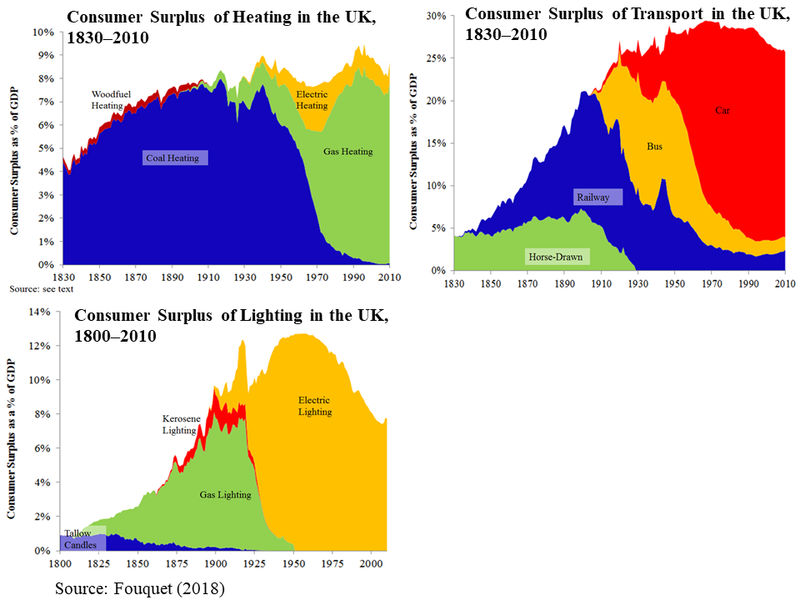 With this in mind, I estimated the net benefits to consumers from heating, transport and lighting over the last two hundred years, and from past energy transitions. Figure 1 indicates the net benefits of energy consumption since the early nineteenth century. Here, these net benefits are measured as the ‘consumer surplus’, which is the difference between what consumers are willing to pay and what they have to pay (i.e., the price), divided by GDP (Gross Domestic Product). By dividing by GDP, it allows us to compare the net benefits as incomes rise over time. We see that our ancestors benefited from cheaper energy sources and improvements in energy technologies, particularly related to transport and lighting. Key energy transitions, such as the introduction of the railways from the 1840s, of gas lighting from the 1810s and of electric lighting from the 1890s, radically improved lives. This raises the question about the difference between heating, which did not lead to great increases in net benefits with energy transitions, and transport and lighting, which did. My conclusion is that improvements in mobility and illumination transformed economies, societies and lifestyles in the nineteenth and first-half of the twentieth century. In contrast, better heating just made people more comfortable. Another important point is that the net benefits of these energy sources and technologies also appear to have been declining during the second half of the twentieth century. This is especially true for lighting. This suggests that future energy technologies and transitions may not radically improve consumers’ lives as much as they did in the past. Of course, what is missing from this study is a measurement of the damage from air pollution and climate change. Indeed, the most obvious benefit from a future transition to low carbon energy sources is that it will reduce the damage, rather than directly increase the benefits. But, this is also why reducing energy consumption has been easier said than done. The benefits from reducing energy consumption do not benefit the consumer directly, if it just means heating and lighting the home less, and travelling less. This is also the main reason we still burn a lot of fossil fuels. Until recently, we didn’t have a cheaper way to power and light our homes, and drive our cars. Rather than changing our lives, we chose to continue polluting the air and intensifying climate change. So, the challenge and hope (now that wind or solar power are much cheaper) for Government, NGOs and researchers like myself is to find ways to deal with air pollution and climate change, and, at the same time, to keep our lives warm, bright and fun. Response to Committee on Climate Change report, UK housing: Fit for the future?